Bluegrass Park at Lexington community is sold out and is not in active development by builder. If you are interested in Bluegrass Park at Lexington or similar new home communities, contact us today! Our agents are very familiar with new and newer construction in Virginia Beach, and can identify resale opportunities in Bluegrass Park at Lexington, as well as builder inventory available in nearby or similar communities in Virginia Beach. To view 11 more pictures, interactive maps and the full, detailed description of the Bluegrass Park at Lexington community, please Login. Real estate in Bluegrass at Lexington Park is townhouse living at its best. New home communities with such style and amenities aren’t average in any sense of the word. Virginia Beach is a great area with so much to offer and these new homes are right in the thick of it. For those who serve in the military, this neighborhood is close to the Coast Guard Finance Center, Joint Expeditionary Little Creek-Fort Story and NAS Oceana. No townhouse in this real estate development is smaller than 2,100 square feet. A townhome in Bluegrass at Lexington Park comes with one or two-car garage, professionally landscaped front yard, sodded front and back yard, wood deck, custom Armstrong cabinetry in kitchen and baths, nine-foot ceilings, custom created closets, gas fireplace with slate surround and much more. While many new home communities may be available, they don’t all come with such impressive features. Another reason to feel right at home here in Bluegrass at Lexington Park is the amenities. New home communities aren’t supposed to look like resorts- or are they? There is so much to do here this piece of real estate can be a place to get away from it all everyday. Swim at the well maintained pool and meet up with friends at the nearby cabana. Or take the kids to the playground for some afternoon exercise. One of the best things about living in southeast Virginia is being so close to everything. Golfers can improve their swings at the Bow Creek Golf Course. Shoppers can find all kinds of goodies at Pembroke Mall, Lynnhaven Mall and a wide array of unique shops throughout the area. Salons, medical facilities, dental practices and banks are all right around the corner. Enjoy a world-class meal at one of the top restaurants at Virginia Beach Town Center. 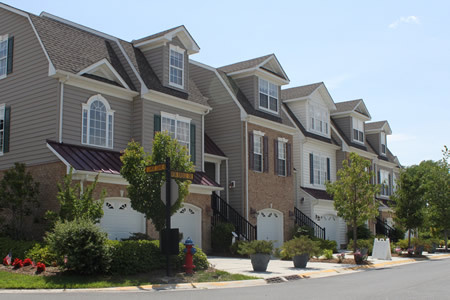 New home communities like this townhouse complex can be a wonderful way to redefine the word “home.” While the navigating the Hampton Roads real estate market may be challenging, it is worthwhile when a homebuyer finds the right new home. Bluegrass at Lexington Park is a place to rediscover what home is all about. Send me more information about communities similar to Bluegrass Park at Lexington. Our agents gladly offer FREE property tours of Bluegrass Park at Lexington, Virginia Beach and homebuyer consultations to all serious buyers. Our Virginia Beach SH Pro is prepared to represent you and your interests so you can move into your dream home.